Carlos Valdez, La Paz, Bolivia — The government has seized a 12,500-hectare (48-square-mile) ranch in Bolivia's eastern lowlands from a soybean magnate who is among the chief political rivals of just re-elected President Evo Morales. The confiscation announced Thursday was the first by Morales' government as it seeks to wrest fallow farmland from big landholders and "restore" it to members of the South American country's long-suppressed Indian majority. Wednesday's seizure, part of what the government calls an agrarian revolution, came three days after Morales' landslide re-election. Unofficial results said he got 63 percent of the votes Sunday, compared to 27 percent for his nearest challenger. The Yasminka ranch taken from Branko Marinkovic will be given to the Guarayo Indians, the deputy land minister, Alejandro Almaraz, said at a news conference. Almaraz led 20 police officers onto Yasminka to enforce a ruling Friday by the National Agrarian Tribunal affirming the government's claim that the land was fraudulently obtained from the Guarayo. The Marinkovic family, which immigrated from Croatia in the 1950s, is fighting in court to keep a slightly bigger ranch, Laguna Corazon, from the same fate. Marinkovic, whose family controls one of Bolivia's biggest soybean oil business, Industrias Oleaginosas, did not return phone calls seeking comment. His lawyer, Victor Hugo Peralta, said Marinkovic had not been notified of the the National Agrarian Tribunal ruling. Until last year, the 42-year-old Marinkovic was head of the Santa Cruz Civic Committee. 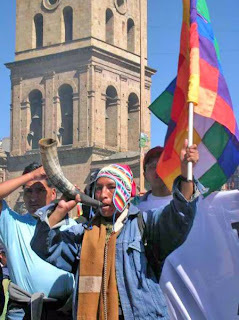 The group, based in the pro-capitalist eastern state capital of Santa Cruz, has been a center of resistance to Morales' effort to radically remake Bolivia by shifting mineral wealth and land to the poor. The government also is moving to seize five ranches in the southeastern Chaco region under a March ruling by the National Institute of Agricultural Reform that the land be given to Guarani Indians. The court said Guarani members had been forced to work on the land as ranch hands, cooks and field workers without pay. The owners of those ranches, totaling more than 36,000 hectares (139 square miles), are fighting the expropriation in court. They dispute the charges of forced servitude. Associated Press Writer Frank Bajak in Bogota contributed to this report.